Confetti Cookies for My Blog's First Birthday! Guys, today is my blog's first birthday. Isn't that crazy? I've been working on this blog for exactly a year! Whatttttttt?! Appropriate, since my love of baking was first discovered through that box mix. But before I share with you the recipe, I wanted to talk a little bit more about my blog. - Blogging is really frigging hard. Like, WAY harder than it looks. Seriously. I realized that the above sentence reads like a line from Clueless, but I couldn't find a better way to emphasize what I mean. But before I started blogging myself, I had no idea the amount of work and talent that was really needed for a successful blog. Not only do you have to be a good cook/baker, you have to be a talented photographer, stylist, writer, editor, front-end developer, graphic designer, marketer, AND brand strategist to boot! That's several different skill sets that are almost all completely different from one another. Yerp. Although my year of blogging gave me important lessons in all skills, I'd say the biggest thing I walked away with is a renewed respect for all the food bloggers out there. All my favorite bloggers, the ones who are more successful than I will ever be — Bakers Royale, A Pastry Affair, Raspberri Cupcakes to name a few — all I can say is this: RESPECT. There have definitely been times in the past where I've been unimpressed with a blogger's photos or I've tried a recipe of theirs that hasn't turned out well. I'm much more forgiving these days, since I realize what time and effort it really takes behind each post, and, even though their results maybe aren't the best out there, I still have to give them credit for trying. It takes a long time to get a handle on all the skills I mentioned, and I've definitely made some mistakes and errors along the way. In fact, I'm still making mistakes with every post! 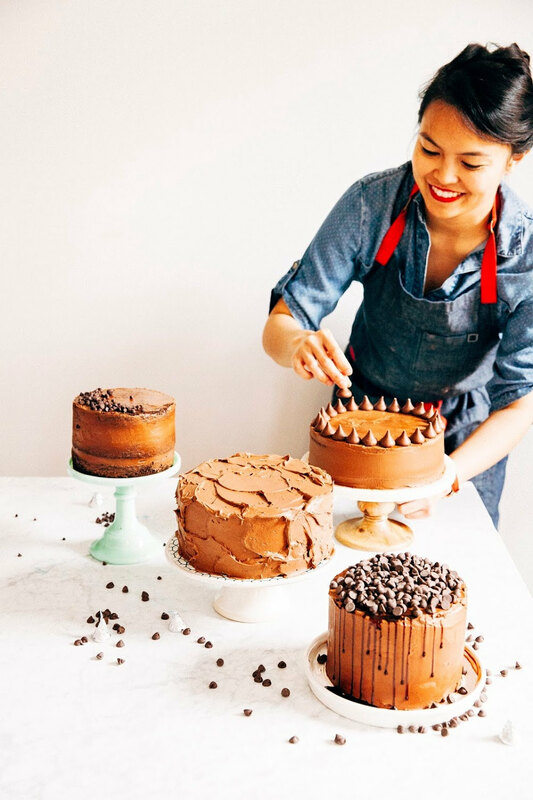 Try not to judge food bloggers' too harshly — most of the time, we're on our own trying to figure this out. - That being said, haters are always going to hate. I recently had drinks with a friend who was surprised by how little traffic and revenue I generated from my blog. After sharing some of my numbers (something I hesitate doing in conversations with my friends), she dismissively said, "That's it?" I was a little bit taken back by her comment. When I wake up and check my traffic numbers in the morning, my reaction isn't one of derision. I have never once said to myself, "Ugh, only X many people have visited my blog today? What a failure." Instead, I see that number with awe and wonder. Awe as in, I can't believe that many people -- strangers, people from countries I've never even been to -- took the time out of their day to come check out my blog. Wonder because there are so many amazing food blogs out there, filled with beautiful photography and narration far superior to mine. But still, people visit my blog, admire my work, sending me such wonderful comments and compliments about my recipes and photography. But my friend obviously didn't see it that way. I didn't bother arguing with her, because what's the point? Ain't nothing you can do except shrug and laugh it off. Besides, what are the haters doing with their spare time? Watching TV? Pinning? Well, I've got my blog, you've got your TV shows. That's all there is. - But there are a lot of good and kind people out there, wherever you are. Always. I'm a negative person. I hate admitting it in such a public forum, written in ink. But yep, I said it. I'm the kind of person who thinks the glass half-empty, sees the worst in every situation before seeing the good. I bet you my friends who are reading this in real life are just nodding their head, laughing, and saying "Oh Michelle!" But food blogging has made me realize how many wonderful, kind, and considerate people are out there. I've received so many kind comments from strangers all around the world, complimenting my photos, expressing their gratitude for my recipes, asking for advice and sharing their own stories. I simply cannot express my gratitude for the sense of community and friendship that food blogging has given me. - Sometimes, you really just don't have a personal anecdote to tell with your recipe. Sometimes, there's really not that much to say about that loaf of banana bread. Nope, Grandma didn't give me this recipe from her wooden antique recipe box. Nope, I didn't spend my weekend wandering around a cute Farmer's Market to find these ingredients. Most of the time, I just found this recipe online and thought it'd be cool to bake it. The end. - Don't even get me started on how long it takes to amass a Twitter following. - Unless you have the time and the money, it takes a long time to find and collect beautiful props, backgrounds, and other pretty things you lust for in other food blogs. - When in doubt, go with something lemon-flavored. Or brownies. Or Funfetti. 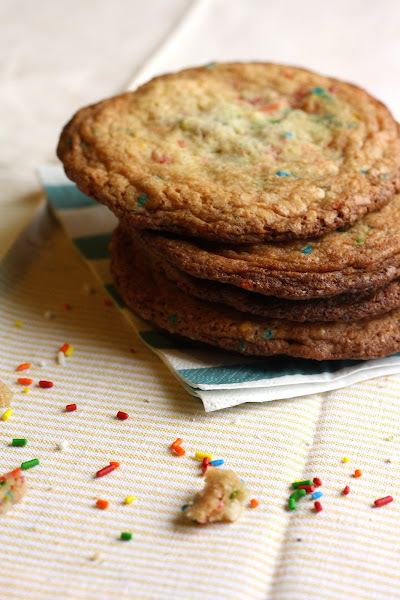 These cookies come from famed New York bakery, momofuku milk bar. Like all momofuku milk bar recipes, this recipe makes use of "crumbs", which famed pastry chef Christina Tosi describes as "clumpy, crunchy, yet sandy little bits of flavor". 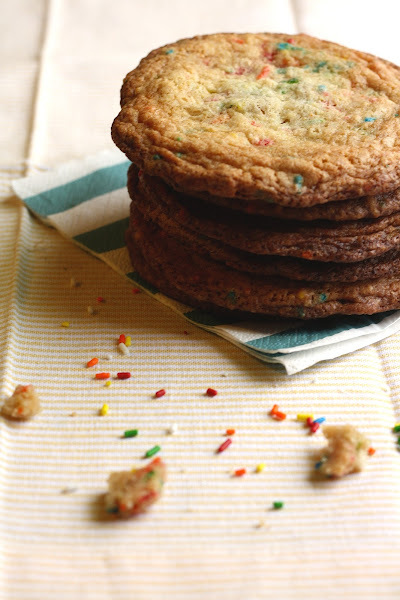 The recipe calls for making birthday cake crumbs first, which you then add to the cookie dough later. The result is an extra salty and buttery crunch in your cookie texture. Delicious. Preheat the oven to 300 (F). 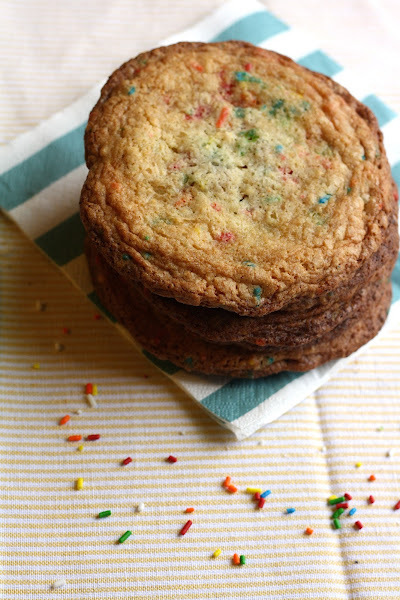 Combine 1/4 cup granulated sugar, 3/4 tablespoon light brown sugar, 3/8 cup cake flour, 1/4 teaspoon baking powder, 1/4 teaspoon salt, and 1 tablespoon rainbow sprinkles in the bowl of a stand mixer fitted with a paddle attachment. Mix on low speed until well combined. Add 1/8 cup grapeseed oil and 1/2 tablespoon fake vanilla extract and paddle again to distribute. The wet ingredients will act as glue to help the dry ingredients form small clusters; continue paddling until that happens. Spread the clusters on a parchment- or Silpat-lined sheet pan. Bake for 20 minutes, breaking them up occasionally. The crumbs should still be lightly moist to the touch; they will dry and harden as they cool. Set aside the crumbs to cool completely before using in the confetti cookie recipe. Combine 16 tablespoons butter, 1 1/2 cups granulated sugar, and 1 tablespoon corn syrup in the bowl of a stand mixer fitted with a paddle attachment and cream together on medium-high for 2 to 3 minutes. Scrape down the sides of the bowl, add 2 eggs and 2 teaspoons fake vanilla, and beat for 7 to 8 minutes. 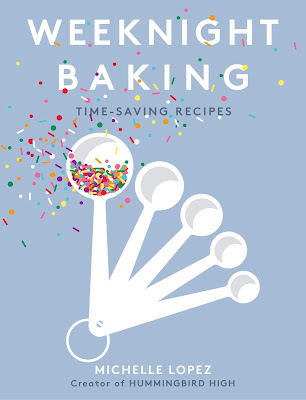 Reduce the mixer speed to low, and add 2 1/2 cups flour, 2/3 cup milk powder, 2 teaspoons cream of tartar, 1 teaspoon baking soda, 1 1/4 teaspoons salt, and 1/4 cup rainbow sprinkles. Mix just until the dough comes together, no longer than 1 minute. Scrape down the sides of the bowl with a spatula. Still on low speed, add 1 heaping cup Birthday Cake Crumbs (from the first recipe) and mix in for just 30 seconds, just until they are incorporated. Using a 2 3/4-ounce cookie scoop (or a 1/3 cup measure), portion out the dough onto a parchment-lined sheet pan. Pat the tops of the cookie dough domes flat. Wrap the sheet pan tightly in plastic wrap and refrigerate for at least 1 hour. Do NOT bake your cookies from room temperature — they will not bake properly. Heat the oven to 350 (F). Arrange the chilled dough a minimum of 4 inches apart on parchment- or Silpat-lined sheet pans. Bake for 18 minutes. The cookies will puff, crackle, and spread. After 18 minutes, they should be very lightly browned on the edges. The centers will show the beginning signs of color. Leave the cookies in the oven for an additional minute or so if the colors don't match and the cookies seem pale and doughy on the surface. Cool the cookies completely on the sheet pans on a cooling rack. happy one year! several great points here, and publishing a blog is definitely a huge learning process and perspective building thing. my favorite thing is the community, such an amazing, positive and giving group! Aye, it's all about perspective. I thought your numbers are awesome for what it's worth. Happy 1 year!!!! I love this post! Blogging IS really friggin' hard and what you do most definitely deserves respect! I missed my one year by two months! Whoops! I love that you celebrated it with the funfetti cookies! Happy blog birthday, Michelle! I only found out about your blog a couple weeks ago and I must say I'm so impressed! I had no idea you had only been doing this for a year. Everything looks so delicious, I'm drooling all over my keyboard! Looks like this post is a little old, so I'm not sure if you'll see this comment, but I totally sympathize with the blogging/food blogging is hard stuff! I've been working on my travel/food/science blog, http://feelingtangerine.wordpress.com/ for only about 5 months now, and I still go to other blogs and think "omg.. they have 200 comments on their post wow!" Anyway, just wanted to let you know that I love your pictures, your baking science, and how real your writing is, if you know what I mean. Thank you so much for this article especially these recipes. I've been always loved cookies.